Painting the back of our media cabinet was one of the first projects I tackled when we moved into this house over three years ago. I chose Jamestown Blue and painted the cabinets mostly while my then 4 month-old slept. It’s a pretty calming blue that worked well for a long time, but I was ready for a change- to dark gray. I considered having the whole cabinet painted, but the quote was too high and I’m not confident enough in my painting skills to tackle such a big focal piece in our home by myself. But, I can handle painting the back cabinet walls alone. It only took one Sunday afternoon. I used Sherwin Williams Urbane Bronze (matte), the same color I painted our back kitchen cabinets to create a cohesive look. The two photos were taken at different times of day, and the white part of the cabinet (Sherwin Williams Divine White) is more like the top photo- it looks a little warm in the bottom picture. The Urbane Brown is a dark gray, with a slight hint of brown in it. The best part of painting is removing the painters tape and admiring your work! I’m not good enough for cutting in by hand, but maybe someday. As soon as the paint was dry, I got to work restyling the shelves. I changed some objects and books around since they looked different against the dark gray. I love how white pops against the dark background, so I added more white accessories. A few books with dreary covers were recovered in a silver snakeskin or plain white wrapping paper. The faux boxwood came in a brown ceramic pot that I spray painted white. I found the tiger print on Etsy. I have a couple more prints I’d like to sprinkle in, but this is good for now. On the left side, a funky pair of candlesticks flanks a picture of James when he first started walking-sweet memories! 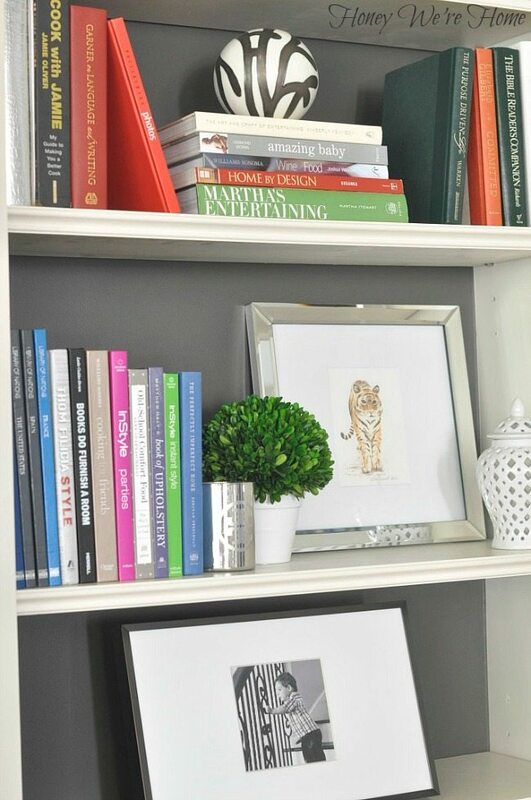 Varying the height and color of the books with pops of lime green and pink keeps the bookshelves from looking too serious. That lime green book on the far left is covered in scrapbook paper too, to bring in more of that cheerful color. On top, I spray painted a larger black frame white and covered one of the books with blue and white quatrefoil paper. For almost all of the books on the shelves, the jackets were removed. Most of you know that this media cabinet was built-in when the house was built, so it wasn’t purchased from a store. A few industrious people have asked about measurements and so forth, so I measured for you in case you are building something similar. I hope this helps! When we had a small townhouse, we used the Pottery Barn Logan as our media center and it was very well built. Do you like the new dark gray color or prefer the old blue better? Looks great! Love that color. Love the gray! It really does make the white accessories stand out more! LOVE your blog! I'm usually a blue fan, but I really like how sophisticated the new color looks. Love that adorable tiger print, too. I've been scouring Etsy lately- lots of great finds. I love the dark gray! Perfect styling!!! Thanks Amy- styling is the fun part, but I'm always rearranging! It looks awesome!! Gray definitely looks better. It is more on trend now. Blue looked great but the change was needed. I agree that the grey looks better now- it feels like a neutral that I can work more colors into now. I LOVE this color. Very subtle, even though it's dark, and so sophisticated. Agree that the white looks great against it. Your styling is perfect! i love the gray! looks great! Dark gray is the winner! No question!! 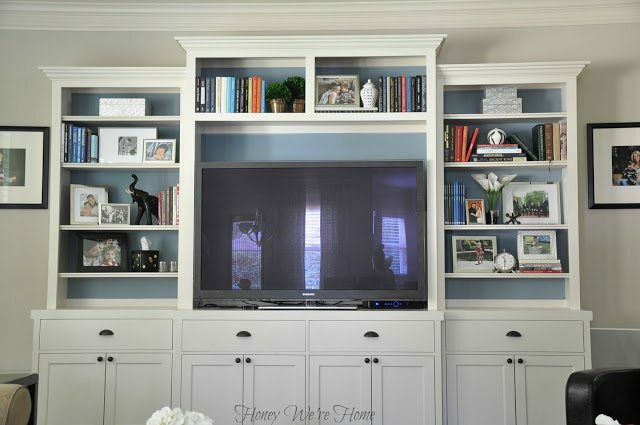 Aside from looking dramatic against the white cabinetry, it also makes your TV disappear. Great choice! Good point! I hadn't considered that, but it's true! I love how it turned out. It adds such a richness to the room. The shelves are styled beautifully! 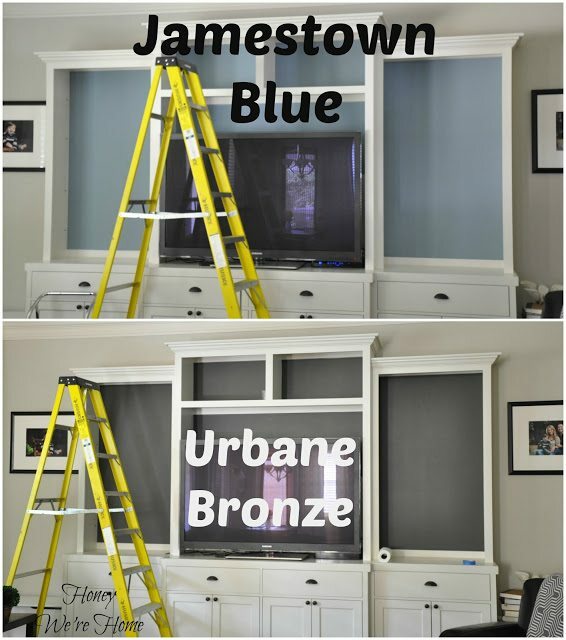 I like the urbane bronze, it ties everything together in the media cabinet. I much prefer the dark gray over the blue! Looks really sophisticated. Well done! Looks great, the new color works perfectly. So nice and clean looking. I love the grey! Great choice. Also, thanks for all the styling ideas. We bought a media unit almost a year ago and I still haven't styled it, no idea what to do!!! Check out my Bookshelf Styling boards on Pinterest- lots of good ideas there! I start with books first- you can try garage sales or half priced books to get lots of books cheap if you don't already have that many. Baskets or large decorative boxes will also help fill in the shelves, then you can have fun layering in smaller pieces and photos. You can also keep in mind a general color scheme that works best with your room. Love the new color! 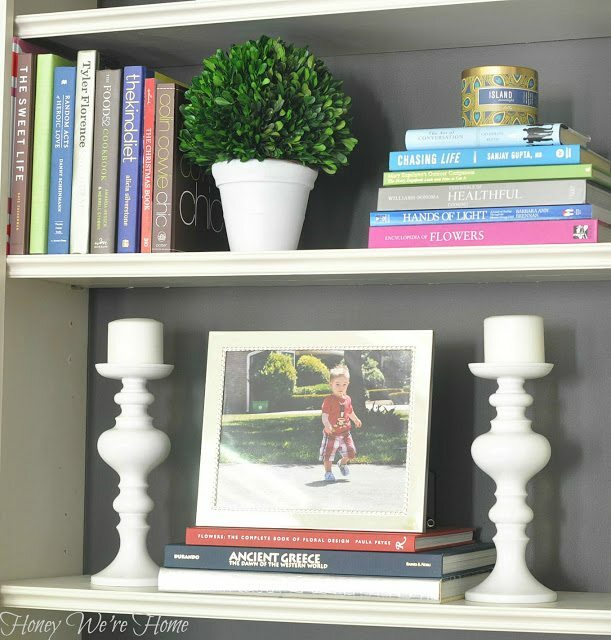 And you have such a good eye for styling your shelves! I absolutely LOVE how the new color turned out! Beautiful! Love!!! Gorgeous!! Everything pops! Amazing Job! I really like the dark gray! 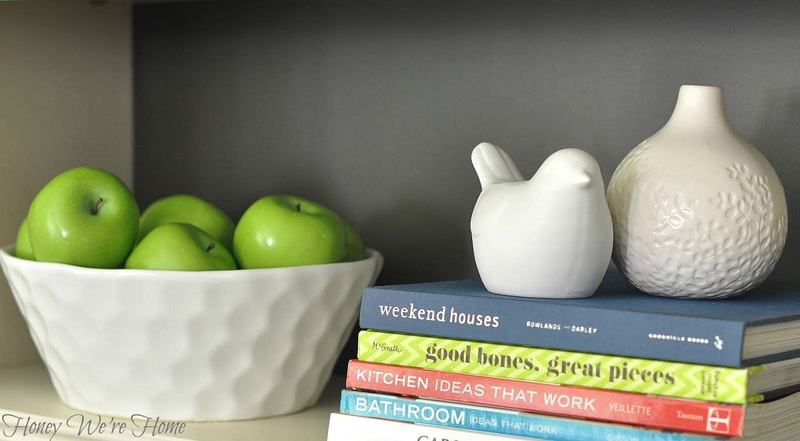 The white accents are perfect (we have that little birdy too!). Looks fabulous! i love the gray! i was a big fan of the blue but the gray is a better neutral for your space. Girl! I LOVE the urbane bronze in their. It looks really sophisticated and warm. Your styling is perfect, too. I really like all of the white accents. Hi! 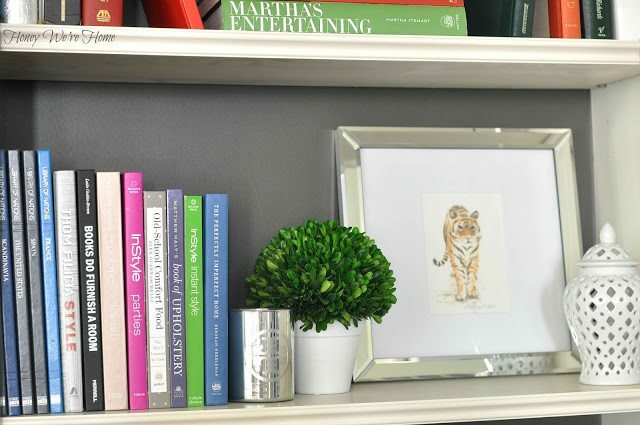 Do you remember the Etsy shop where you found the tiger print? It is so cute! I la la love the dark gray! What a difference! It instantly updates the built ins! Great move there! love love love the new dark gray!! 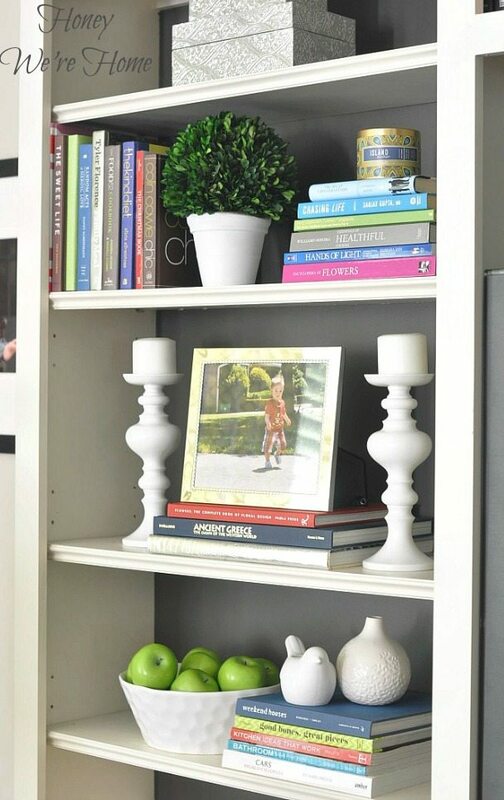 and your shelf styling is perfection! The styling looks so great! And I just love the dark gray against the white! Our guest bedroom has dark grey walls with all white furniture and bedding, and I just love the contrast! I think it feels so cozy. LOVE the gray!! I'll choose gray & brown over "colors" every time! Ooooh, that gray looks FAB! Great choice! Love the urban bronze Megan! Very classy and sophisticated and your styling is spot on. Those photos of James are precious! DArk gray for sure! I love the white against the dark too. Oh, I like it!!! Looks sleeker and more stylish! I think the grey looks amazing. I loved (& pinned!) the kitchen cabinet you used it in and think it ties in perfectly. I liked the blue quite a lot but this grey looks even better! I love the Urbane Bronze! Its much more cohesive with the rest of your house. It also makes the colors of the books and accessories pop so much more!! I love the dark grey! Especially with the TV, it just blends in now. And the books and accessories around it pop more. Great change! I love the grey color!!! Its much more sophisticated and seems to match your other furniture in that room as well !! Very, very sophisticated! I love the styling and thanks for all the tips. 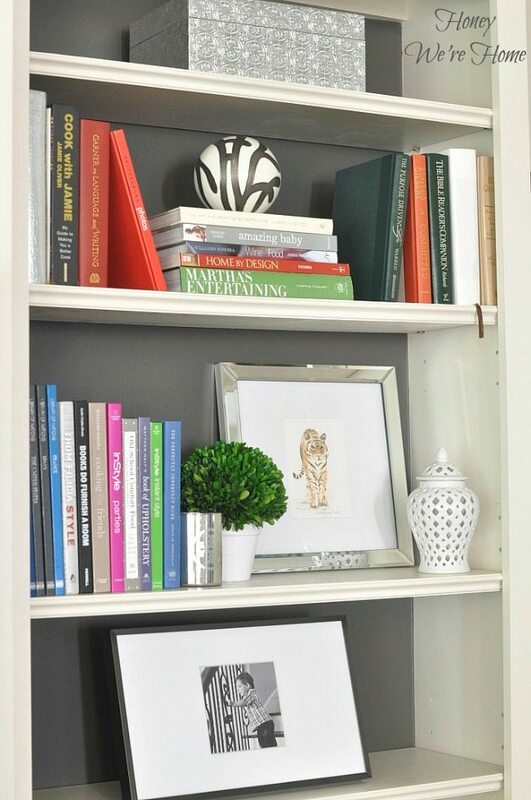 the gray makes the bookshelf and the room look much more sophisticated. I love it! where did you acquire the faux boxwood plants. i've been looking around for a couple small ones but haven't had any luck. PB had some recently but way too big for our bookshelf. Love, love the dark gray! And your styling looks amazing! I LOVE the dark gray!! You have chosen such perfect paint colors for your beautiful home! Can you please describe Accessible Gray and Anew Gray? Do they lean blue or green throughout the day? Are they warm grays? Gorgeous colors! I LOVE the grey. It's much more neutral than the blue. Did you have to sand or prime before you painted? Sorry…I just saw where you wrote that you didn't sand or prime before the grey, but did you when you painted it blue? Also, what sheen did you use? I'm so sorry I'm just seeing your question, the unit was built-in when we bought our house. This looks really lovely. I am wondering where you got the entertainment center? Great question, the unit was built-in when we bought our house. I am in love with your media cabinet. I love the new urban bronze color! I am planning to built one similar to it. Could you tell me the dimensions of the shelves and cabinets? Thank you! love your cabinet and your website!! great great taste….love it all. 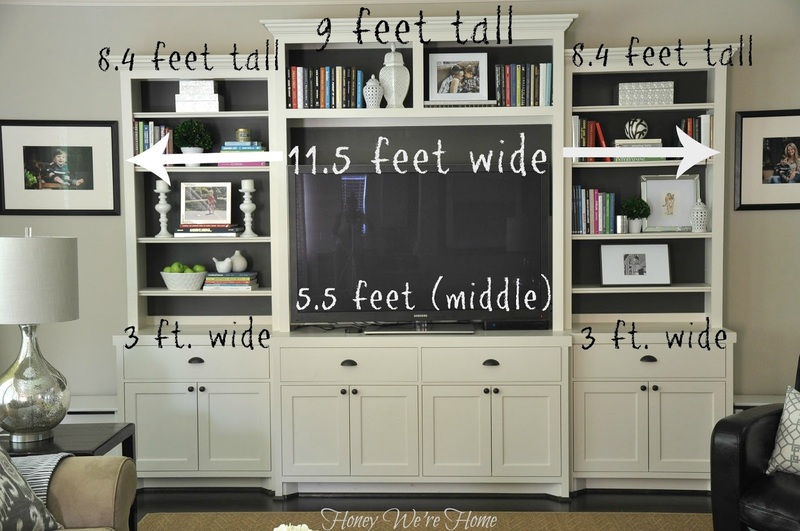 can you please give us the depth of your shelves & the lower cabinet? your drawing didn't show that… I am looking to build something very similar.. I just read your post again and saw that you had it built. Love it!